As you all know, slings aren't the most terrifying weapons and are seen somewhat as a joke by outsiders. Well, it's time we show them otherwise! I will be conducting a small project that will benefit members of our community. Description: These acidic bullets are capable of turning enemies to stone! The best ideas will be decided by me after enough time. Once the brainstorming is done, this will allow me to research and find the necessary materials for each bullet which is vital for the enchanting process. There are several things that would help me during the course of the project. 1) Someone who can make bullets (Please let me know if you can think of anyone who can do this). 2) Volunteers for the enchanting process. Including but not limited to: bards, druids, clerics, wizards, and sorcerers. Remember that this is a piece of work that will take some time. Hopefully, we can restore some of our traditions back to life as a community made mostly of Hin! I'm able to craft bullets of any type you might need. I might even have some bright ideas in my noggin. Grand! I'll be contacting you for such. Please do suggest your bright ideas, as well as anyone else who has any. Hopefully, we can have a variety of bullets that would be useful for different occasions. True, after some thought and prayer, pens a suggestion to Rosary. • Gold - Used for holding properties of the enchantment spell school, 'blindness/deafness', during the enchantment process. Shiney. • Chalcedony base (carnelians, chrysophase oragates) - Often used in the making of magical items to ward against undead or have necromantic powers. Susceptible to anti-undead enchantments. • Silver Coating - Effective against undead and works well with the necromancy school for enchanting purposes. • Adamantine - Effective against Constructs, strong material. • Garnet - Holds properties to enhance the impact on weapons when the enchantment is called on. • Mercury/Quick-Silver - Has a certain toxicity on contact. Highly capable of holding transmutations enchantments. • Gold - Works well when used in the abjuration and illusion spell schools for enchanting purposes, and suitable weight. • Zarbrina (For enchantment process) - Acceptable alternative for spell ink concerning illusions. • Mithral - Good conductivity for both cold and sonic energy types. Susceptible to spells working in the evocation and conjuration schools. • Steel - Conductive and lends well to manipulating acid energies, less susceptible to tarnishing than iron. Also fairs well with transmutation for enchanting purposes. As we discussed I should be able to make those bullets for you whether Wilfire makes a bullet mold or not. Wilfire spends sometime working on making some Molds from Clay. He acquires several kinds of bullets often found for sell on Kirb's and starts placing them inside the clay and gently works to make the clay get a nice portable form around the bullets then he proceed to bake em. After the Clay solidifies, he takes his tools and gently cuts it in half opening it taking the bullet out and checks to see if the mold took the right form. He would make several of them until he is satisfied with the results! With the molds now in hand and the help of True, the creation of the bullets goes quite smoothly. 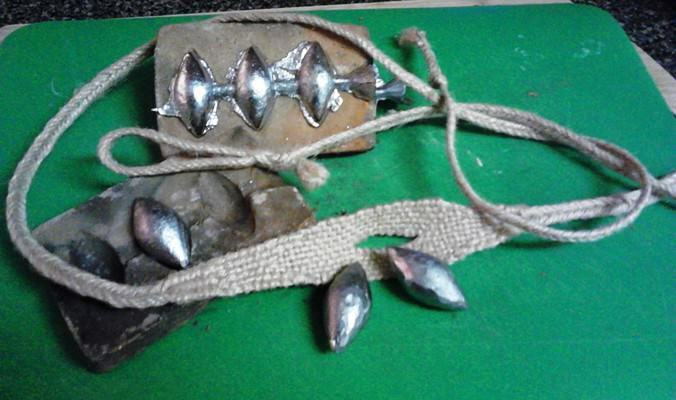 The silver, gold, mithral and steel bullets are easily made with Wilfire's molds. is made, the gems are then placed in the molds and kept in the middle of the molds with the created pins. The molds are filled and any excess metal from the pints are cut off once the bullets have cooled and solidified. Finaly all the bullets are polished nicely. True assists Osric in fashioning the bullets. He first ensures the mold flashing is carefully trimmed, and the excess edge material is planed down to the generalized surface of the bullet to ensure no spin or wind resistance will interfere with their trajectory. Polishing is then done in a progressive fashion starting with a course grit, then medium, then fine, then a turn on a hand cranked cloth wrapped polishing wheel to a high sheen. True then personally inspects each bullet "in sling" giving them a spin to ensure proper fitment and balance. Once satisfied with the mechanical and operational worthiness of each they are placed in a velvet lined box for transport to the enchanter. Upon completion the bullets are handed to Rosary and the molds are either handed back to Wilfire or given to Pebble's armory for future bullet making. Once the bullets were crafted by the fletcher and blacksmith, Rosary accompanied by Osric head over to the caravan at the back of the town to set up their enchanting workshop. Using the pure water from the local Dal-Il-Son water purifier, each bullet was placed in separate flask cups with this so they were just about submerged. A pinch of diamond dust were added to each. After much discussion about enchanting methods between the divine and the arcane, and recapping what the bullets will do, they decide it's best to pour holy water for some of the cups where divine magic would be needed. This included the currently unenchanted 'Lucky Balls', 'Guardians' and 'Deceivers'. All the bullets would soak in the properties of these components for more than a couple of hours, allowing them to be a good conduit of the weave when the time comes to enchant them. 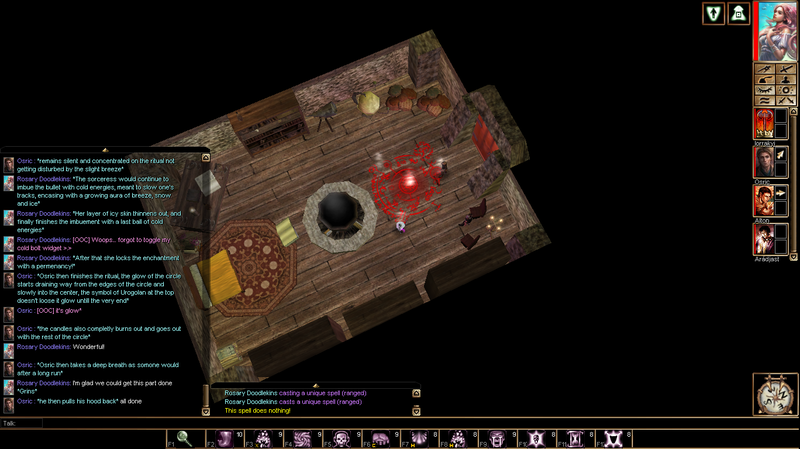 A certain Halfling sorceress can be seen making her way towards the chosen workshop and would stay there for a long while. After much contemplation on what to begin with, she decides to first pursue what she already knows and has expertise in. Much chanting in Celestial can be heard coming from the caravan during the evening. It seems the sorceress was busy at hand, beginning the first bullet. 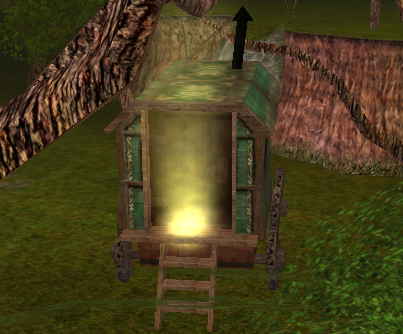 During the later moments of the enchanting session, a bright golden light pierces through the gaps of the door and keyhole of the caravan door. If one were to come too close to the caravan, chanting can be heard in some mornings. Otherwise, it would mostly appear to be quiet. Whether it was making preparations or dwelling more into the arcane, Rosary would work tirelessly on the project. Regular breaks would happen during the afternoon, where she would return home or sit quietly on the bridge drawing strings of scribbles in her notebook. The scribbles would connect to form an odd design of arcane etchings. It would become a usual routine to see her outside the caravan on high morns with the mercury and adamantine bullets and notes scattered around her. She can be seen studying and practicing various techniques of casting over the next couple of days. A group of four adventuring Hin can be seen making their way into the caravan temporary workshop. This group consisted of a pink haired sorceress, a cleric of The Hound, a Greenspan slinger and a tattooed warrior. Talk about the use of the caravan occurred and after much general chatter about two specific bullets, the rowdy talk appeared to have changed into something productive. Chanting in celestial can be heard, that of a male and female voice, suggesting a joint effort of work. For some moments a cold breeze can be felt coming out of the caravan. It seems more magical business had occurred once again after a long break of silence within the area. On one fine evening, the sound of joint casting can be heard from the caravan. 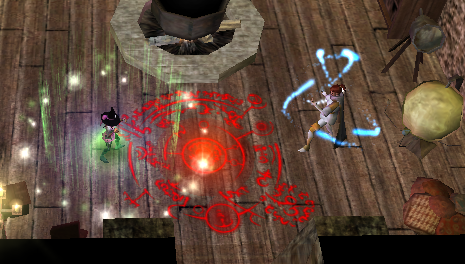 A certain sorceress asking the help of a wizard? Who would have thought Rosary would swallow her pride. 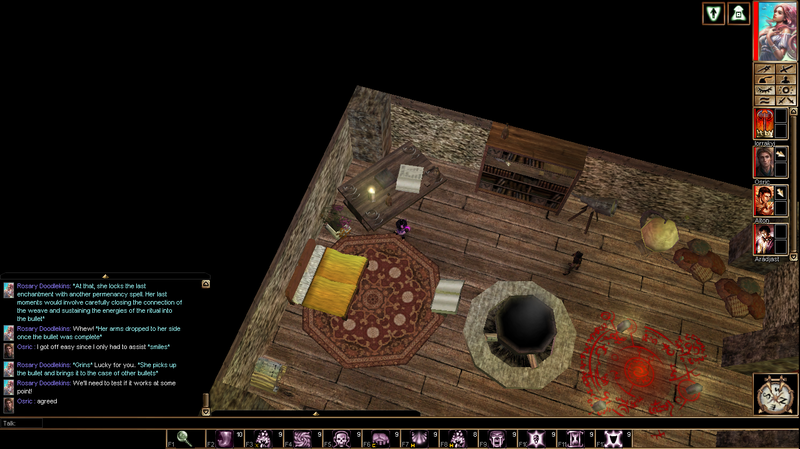 Osric can be seen headed to the caravan located in the back on Bendir and soon after a few flashes of light can be seen in it's windows. 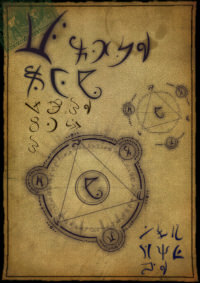 Once inside the caravan Osric starts by drawing out the design for the creation of the "Lucky Ball" bullets, the design would contain a symbol of Urogalan at the top aswell as the component for the Blindness spell and an alteration from the book of transumation for a bless weapon spell to change it's energy type to positive. Once the circle is drawn he places down five candles at the edges of the design, then places the bullet in the middle. The bullet had already been soaked in holy water containing diamond dust in preparation for the enchant. Soon after he starts the ritual for the enchant and begins with channeling a blindness spell into the bullet, it's at this time some white flashes could be seen in the windows of the caravan. 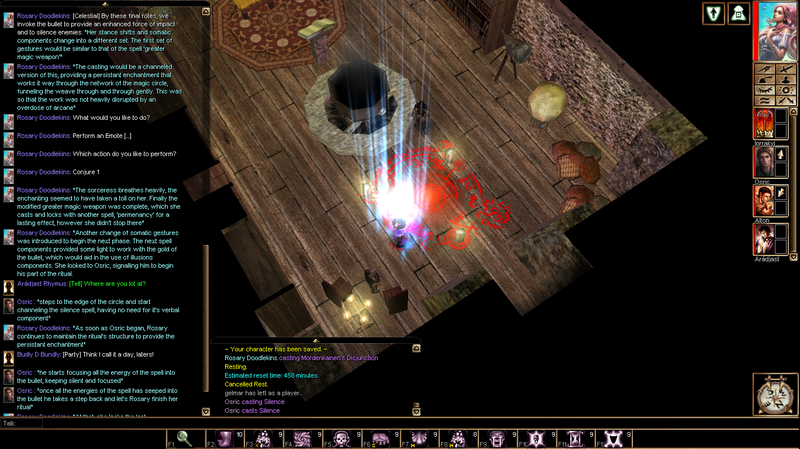 Once the blindness spell has absorbed into the bullets he does the same with a transmuted bless weapon spell this time blue flashes would be seen in the caravan windows. 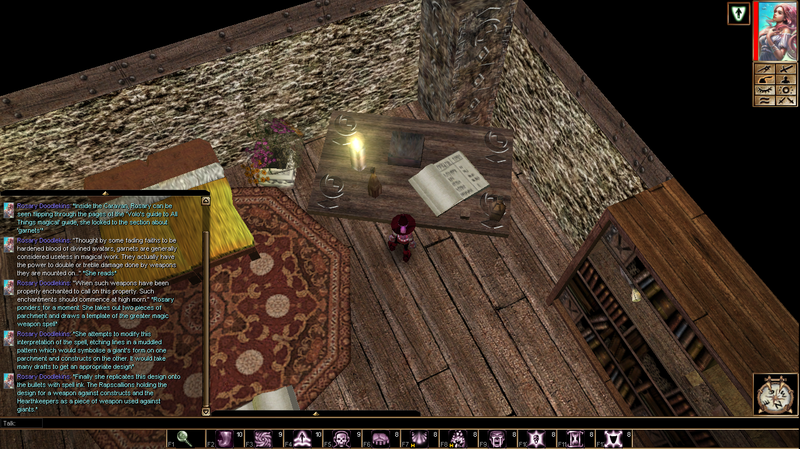 After a while the caravan goes dark again and once he's done cleaning up the chalk design and the burnt out candles the tired hin can be seen headed to the inn for some recuperation.